At the beginning of the season, the Brewers maintained a minor league farm system that many scouting databases deemed one of the worst Major League Baseball. Despite utilizing four first-round draft picks in each of the last two first-year player drafts, the organization entered 2013 without any of its prospects considered to be future stars at the next level. As of Wednesday evening, no Brewers farmhands were featured in Jonathan Mayo‘s top 100 rankings over at MLB.com. Yet the first month of the minor league season proved Milwaukee’s farm system may not be as shallow as previously thought. Several pitchers and position players with relatively low stocks heading into the season have caught the eyes of scouts early on, and could be well on their way to promotions in the near future. Conversely, some prospects have witnessed their stocks decline after a month’s worth of play. Quite possibly no prospect in the system got off to a hotter start at the plate with respect to power numbers this season than Garfield, who with five home runs in 24 games is already approaching the 12 home runs over 66 games he mashed last season with low-A Appleton. Behind the dish, Garfield improved immensely in April, committing just three errors and allowing three passed balls in 20 games, boasting an improved 8.00 range factor that’s on par with the likes of Buster Posey. Coulter, last summer’s 27th overall selection in the first-year player draft, certainly gave fans enough reason for optimism after posting a slash line of .302/.439/.444 and a .419 wOBA over 49 games in rookie ball last season, and his decent play behind the plate only added to that. His first month of 2013, however, was far from that. In his first stint in low-A ball, Coulter’s strikeout rate (23.2%) increased, walk rate (10.1%) decreased and has yet to produce a multi-hit game. His fielding efficiency (.953 Fld%) and range (7.36 RF) behind home plate regressed, too. Haniger’s 2012 campaign in low-A was cut short by a PCL injury in his right leg, but after a strong spring training showing in Arizona and scalding return to the Timber Rattlers, the injury doesn’t seem to be affecting his performance. While his batting average and slugging percentage remain close to where they were last season, April revealed a much more selective approach from Haniger. He cut his strikeout rate (11.1%) by a handsome 12 points from where it was last season and his range in the outfield has improved a notch. With each passing day, it seems the debate over whether or not the Brewers should give Gennett an opportunity to contribute gains considerably more steam — and his hot start at the plate in April is a big reason why. Though his strikeout rate (13.6%) is up and walk rate (2.5%) are down from last season, he found plenty of holes in defenses, producing a .470 BABIP with triple-A Nashville. 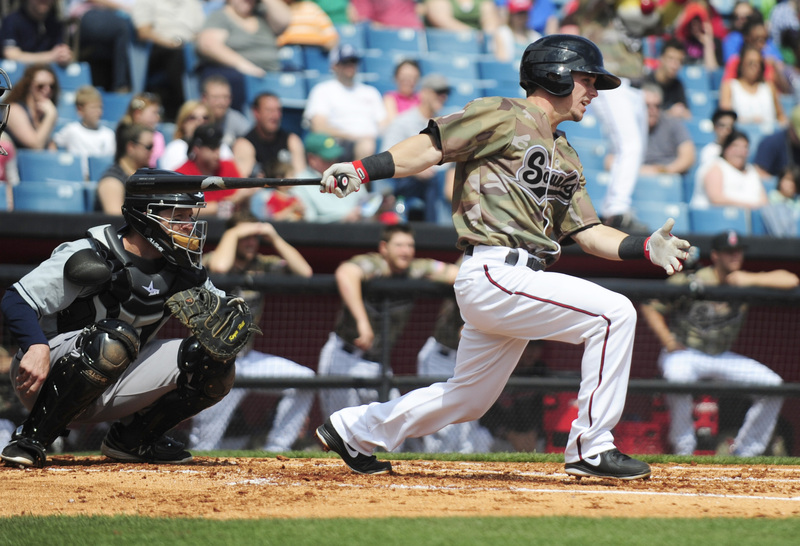 Gennett’s lack of power may be the only thing holding him back from a big league promotion. When the Brewers took Jungmann at No. 12 overall in the 2011 draft, they were told they were drafting a pitcher with great command, tremendous strikeout capabilities and a guy who would more often than not go deep in to each start. But in his first month in the double-A Southern League, he looked far from that. In five starts, Jungmann put nearly as many men on base via walk (14) as he did strike out (16), and he lasted on average only 4.2 innings in those starts. Granted, he held batters to a .250 average and .290 BABIP, but the fact that his previously touted command has been nearly non-existent this season is reason for concern. 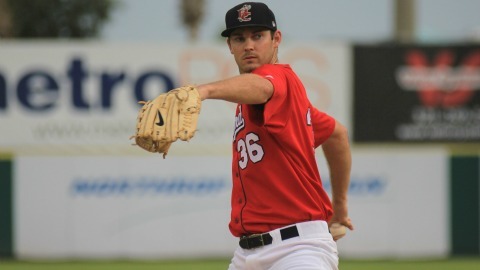 Gagnon’s April began underwhelmingly, allowing 18 earned runs to cross home over his first four starts of the season, which totaled just 16.2 innings. However, he would rebound in his final start of the month in which he pitched 5.1 innings and allowed just four baserunners. Hopefully the end of the month is sign of good things to come because, as a whole, Gagnon’s command regressed tremendously. His WHIP of 1.82 in April was a far cry from the impressive 1.10 WHIP he posted last season in high-A ball. Though the Alabama product made huge strides during his stay at high-A and double-A ball last season, Nelson told me in Janurary that the biggest concern for him was being consistent from start to start . And that’s exactly what he did in April. In none of his five starts did he last through less than five innings and in none of those did he allow more than five hits. His swing-and-miss capabilities have revealed themselves on a regular basis and his command has been superb. Shouldn’t be too much longer before Nelson gets the call to triple-A. Acquired in the Zack Greinke trade last season, many scouts believed Pena had the potential to be a back-of-the-rotation arm. Not even a year later, and there are concerns that he may not be a serviceable reliever. In five starts with double-A Huntsville this April, Pena’s swing-and-miss stuff vanished and his command only worsened, in turn leading to an obscene 7.25 BB/9 rate and disheartening 4.84 K/9 rate. No starter in the organization had a more rough opening month than Pena. 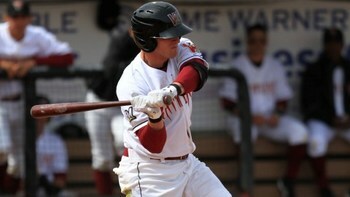 Michael Reed, OF, Wisconsin Timber Rattlers (.323/.384/.446, .382 wOBA) –Accumulated four doubles, two triples and 29 total bases in April, finishing out the month with a nice seven-game hit streak. Nick Ramirez, 1B, Brevard County Manatees (.245/.312/.439, .320 wOBA) – Strikeouts are still a problem, but raised his walk rate by over three percentage points from last season en route to 45 total bases. 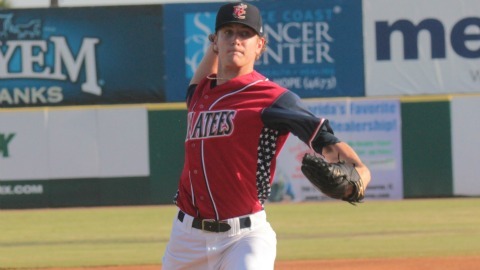 Jacob Barnes, RHP, Brevard County Manatees (2-0, 1.08 ERA, 2.84 FIP, 12 K/5 BB, 16.2 IP) – Held batters to a palty .177 average and posted a 0.96 WHIP in three starts and one relief appearance. 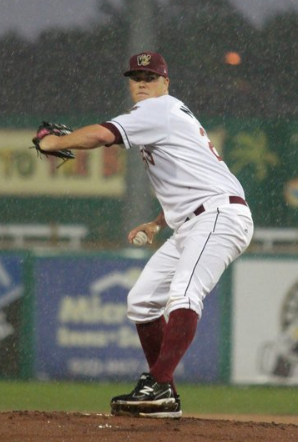 Damien Magnifico, RHP, Wisconsin Timber Rattlers (2-0, 4.00 ERA, 3.87 FIP, 19 K/7 BB, 18 IP) – Walks are down and strikeouts have increased, and has strutted his triple-digit four-seam fastball on a regular basis. Tremendous potential as a late-inning reliever if these all continue. For a minor league ballplayer, the journey to the promised land — breaking through to and remaining at the major-league level — is one filled with highs and lows, celebration and criticism, buildup and recession, and the like. To be sure, it is an unique process very few are able to participate in. Yet for as truly unique as the journey undoubtedly is, the values learned and virtues acquired along the way often parallel those in mainstream society: Hard work, determination and consistency eventually lead to success. These are just some of the values that Jimmy Nelson holds dear to him both on and off the mound. Embarking on his fourth season as a valued pitching prospect in the Milwaukee Brewers minor league system, Nelson, 23, has become a standout prospect in the Brewers minor league organization since being drafted by the club in 2010. He made his way to double-A ball midway through last season, going 2-4 with a 3.91 ERA and 1.54 WHIP while striking out nearly a batter per inning. Before that, he spent time with the organization’s rookie club in Helena, Mon., low-A team in Appleton, Wis., and high-A squad in Brevard, Fla.
Nelson this fall also participated in Major League Baseball’s Arizona Fall League, where he learned from new coaches and gained valuable experience against a handful of baseball’s top minor league prospects. This year, the 6’6″, 240-pound Niceville, Fla., native is setting his expectations high, aiming to impress the coaching staff at spring training en route to hopefully making his debut with the Brewers by season’s end. And wouldn’t you know, he carries with him those same aforementioned virtues everyday, both on and off the mound. I had the opportunity to catch up with Nelson earlier this week. Here is the full transcript of our conversation. AD: How’s your offseason been, Jimmy? JN: It’s been going very well. I’ve been working out at a place near Houston since November, and just getting ready for spring training. AD: What’s a typical workout day for you? JN: We get up and stretch around 10:00 A.M. and do our warm-up stuff and stretch out our shoulders. Then, we throw and lift, do our run, swim, do yoga. After that, you get to do whatever you want. AD: Last year you got a call-up to double-A ball around mid-season. What was the transition like? Anything noticeable? JN: Oh, man. That was definitely the biggest jump in my opinion. Going from rookie ball to low-A, and then low-A to high-A, things are relatively the same as far as competition. Going to double-A, it’s like night and day. Hitters are much more patient, they know the strike-zone very well and the [strike] zone is a lot tighter. You’ve got guys that are older and know the game better, and just a lot of good players and prospects. You definitely need to step up your game and learn how to get guys out in different ways. AD: Could you explain what you mean by “getting guys out in different ways” a bit more? JN: Pitch sequences, learning the hitters better, adjusting to the hitter by what they’re giving you and what their swing. It’s all stuff that you and your catcher work on. At that level, catchers can tell by a hitter’s stance or swing what pitch you need to throw in certain situations. AD: You went on the disabled list for a while last year. What exactly happened? JN: When I was with Huntsville, I had three or four starts and then went on the disabled list for a month, and then I had three or four starts after that. But when I went on the DL I had shoulder fatigue and inflammation, so that needed some time so I could get where I wasn’t pitching through pain. AD: What was the reason for the fatigue? JN: It’s just one of those things. After throwing a lot of pitches and a lot of innings over the course of not just that season, but over previous seasons. That’s just something you try to prevent by getting in good shape and doing all of your shoulder exercises. Even if something does happen, it’s out of your control. Sometimes that stuff just happens. AD: Did you notice any difference from the way you pitched before you went on the DL to after? Or even from high-A to double-A ball? JN: Not really. As a pitcher, you want to pitch to your strengths. It’s not like I’m trying to trick guys out there. My game plan from high-A to double-A was pretty much the same. You can’t try to pitch to a hitter’s weaknesses, you have to pitch to your strengths. That’s one thing that the pitching coaches taught me. You just try to attack guys; getting that first-pitch strike, and getting ahead in the count. The counts are much more important at the higher levels. AD: So there is a big difference in the umpires’ strike zone, then? JN: Definitely. You can tell it’s tighter once you get to double-A. But, it’s going to be tight in the big leagues, so you’ve got to learn somewhere. AD: I understand you contributed to a combined no-hitter on August 2. What was that experience like? JN: Yeah, it was one of my first starts off the DL. That was pretty cool. Truthfully, I didn’t even realize it was a no-hitter because I had walked a few guys, so I was a bit disappointed in myself. I didn’t even know it until I had come back from the dugout. I looked up at the scoreboard in the seventh or eight inning and there were no hits. AD: Any odd plays that you remember from that game? JN: I guy hit a hard ground-ball back at me and I did this jump-kick thing, trying to stop it. The ball went up in the air and landed on the first-base line and our catcher [Anderson] De La Rosa bare-handed it and threw it side-arm to get the guy out. It was pretty incredible. AD: Any double-A players you pitched against that stood out to you? JN: There’s so many. Stefen Romero, for some reason, I feel like it’s the hardest thing in the world to get that kid out. The lineups are pretty solid all the way through, though. There aren’t really any holes. AD: How’s the hitting been for you? JN: I mean, we don’t do it very often, but in spring training we’ll work on bunting and situational stuff like that. But I’m pretty confident in doing what I need to do in certain situations. I’m not going to hit the ball all over the field, though. I haven’t done that since I was 15. AD: Looking ahead to 2013, what is one thing you might need to improve on? JN: I can give you two words for that: strikes and consistency. I showed in high-A Brevard [County] that I can say in the strike zone for a whole game and do that for several outings. But then I also showed in double-A that I wasn’t as consistent as I was in high-A. I know my stuff is there, I just have to be consistent in the zone, attack it and get ahead of hitters. Once I can do that from start-to-start, then I think that’s when I’ll take that next step. AD: How has the changeup worked for you? JN: It’s gotten a lot better, especially in double-A. I didn’t have as much of my fastball as I did the first half of the season, and in double-A guys will lay off the high fastball. My changeup has definitely come to strides, though. I consider it a serious weapon. AD: Are sinker and slider still your biggest strengths? JN: Yeah, definitely. But I want to get where I can see all four pitches as my strengths, and have as much confidence in any one of them to get a hitter out. AD: You took part in the Arizona Fall League his past fall. What was that experience like for you? JN: That was a really cool experience. I got to meet a bunch of players from different organizations, some from the [double-A] Southern League, and then I got to meet some of the best players in the minors. Throwing against that type of quality players was a great experience. Coming into it, all the coaches from all the different organizations already know what you need to work on, and that’s part of being a professional as far as knowing what you need to work on. It was a bit of a laid-back atmosphere, especially at the end of a long season. AD: You got to play with other Brewers prospects such as Johnny Hellweg during your stay. What’s the scouting report on him? JN: He’s a tall guy. Almost like the Brewers putting together a basketball team — we’ve got a lot of big guys. He’s got kind of a three-quarters arm slot, very easy and smooth delivery, can sit up in the mid-90s easily, definitely got some good movement on his fastball and a good breaking ball. I’m excited to see how he does. AD: I know you had a chance to play with Jean Segura in double-A ball after he came over from the [Zack] Greinke trade. What’s he like in the clubhouse? JN: He’s a good guy. Full of energy. From day one it seemed like he’d been one of the guys for a long time. Very laid-back guy. Brought a lot of energy to the clubhouse. It was fun to have him around. AD: What’s your status for spring training? JN: I’m not sure yet. I don’t know the exact date I’m supposed to report. They just told me that I’m coming early, so I’m just assuming I’ll report the second week in February. Whether I go to the big-league camp yet I’m not sure. AD: What are some of your goals for 2013? JN: Making it to the big leagues and help win at that level. Other than that, just keep improving my pitches and command. Getting ahead of guys, and getting guys out with three pitches or less. I learned a lot last year, so I’m just looking to improve on that, really. Staying consistent, too. I stayed consistent for half the year last year, so now I’m trying to do that for the whole year this year. AD: You’re now two years removed from your stay in low-A Appleton. Do you have any advice for players in the lower levels of the minors? JN: I mean, at those levels, it’s a big transition phase. You’re learning about professional life and new work habits that you have to develop as far as getting your work in and getting to the field early. You have to learn your own routine and stick to it. It’s really just a big chess game for pitchers and hitters. 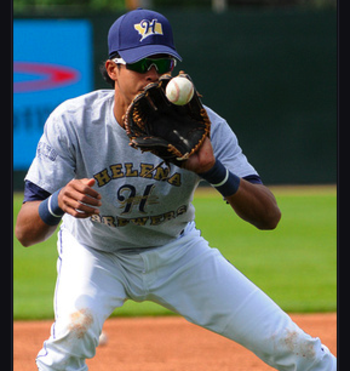 AD: Baseball America just released their top 10 Brewers farmhand rankings for 2013, and you placed No. 5. Does that affect you at all? JN: No, not at all. It has no say in how I act or what I think. I mean, it’s very nice to be recognized, and I appreciate it greatly. But as far as it comes to us getting our work in and doing what he have to do, it’s not going to change anything. You have to take that stuff with a grain of salt. Baseball is a crazy game. You can be rated high one year and low the next, so you have to learn how to deal with it. Of course, you’d much rather deal with the highs, but either way you still have to stick to your process and keep your mind on things you can control. AD: Do you think that might actually get the better of some players? JN: I don’t think so. Not at the professional level, because everybody realizes the ultimate goal of contributing at the big-league level, whether that’s at single-A or triple-A ball. I think however you get there, whether you’re a prospect or not a prospect, it doesn’t matter. I’ve seen plenty of guys who weren’t ranked a prospect play out of their minds, and I’ve seen guys ranked a prospect struggle. It’s a two-way street, really. AD: I appreciate the time, Jimmy. Good luck with spring training. Hope to talk with you again soon. JN: No problem. I appreciate it. With the All-Star break now upon us and Major League Baseball’s 2012 first-year player draft in the rear-view mirror, the natural inkling of many baseball fans is to check up on how well things are going down in the minors. If you’re a fan of the Milwaukee Brewers, it would behoove you to know that things are going very well this season down on the farm — at least much better than what was expected. Coming into the season, the Brewers were noticeably dry on the farm despite a talented flock of youngsters from the 2011 draft itching to get their feet wet in professional ball. 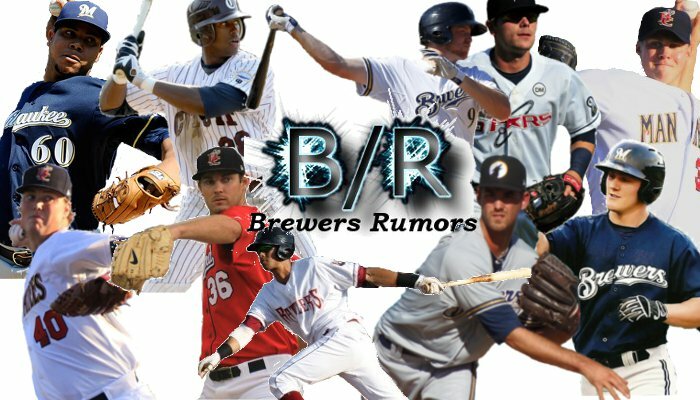 But after a strong 2012 class that saw general manager Doug Melvin add a few power bats early on, the Brewers are yet again proving that their scouting department is among the best in baseball and that they’re nearly recovered from the trade that put Zack Greinke in blue and gold back in the winter of 2010. So in an effort to help satisfy your crave for Milwaukee’s top minor league youngsters while Ron Roenicke and company reboot for a second-half run, here is my updated top 25 prospects at mid-season. Signing on as a non-draft pick free agent way back in 2005, Rivas has now spent upwards of eight seasons in Milwaukee’s system. Having gone through Tommy John surgery, demotion and now conversion from starter to reliever all during that timespan, Rivas has had both extreme highs and lows thus far in his career. Once thought to have the stuff of a back-line starter in the bigs following a stellar 2009 campaign, the now 26-year-old Dominican Republic native pitches exclusively out of the bullpen in Triple-A, and he hasn’t exactly flourished. He’s walked nearly as many batters as he’s struck out, posting a groundout-to-airout ratio of just 1.28 and a WHIP of 1.70. Rivas throws a low-90s two-seam fastball that gets good movement and a mid-90s four-seamer that straightens out and gets crushed by opponents when left in the zone. His slider has been anything but a swing-and-miss pitch, as he’s struggled his whole career to command it. Rivas’ best pitch is his changeup, which Baseball America rated as the best pitch in the system after the 2009 and 2010 season. If he has any intention of sniffing the majors, he’ll need to develop his slider. Brought into the organization as an extremely raw 16 year old from the Dominican ranks in 2006, Manzanillo struggled mightily with his command, walking a wholesome 47 batters over 16.1 innings in the Arizona Rookie League. His next two seasons in rookie ball were almost as unsightly, posting a WHIP of 1.97 over 27 appearances during that span. 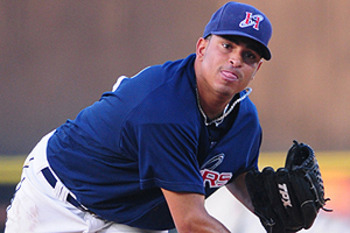 Manzanillo then blew out his elbow prior to the 2009 season and underwent Tommy John surgery that cast a serious shadow of doubt over his career. 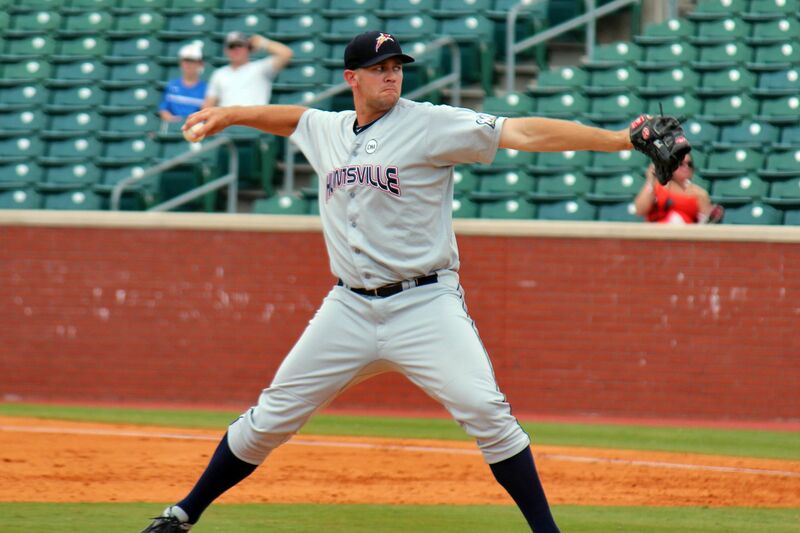 However, he came back in 2010 and saw massive improvements with his command in low-A ball and then proceeded to crack Huntsville’s bullpen in double-A by the end of last season. Last year, he overpowered hitters with a strikeout rate of over 23 percent and notched 17 saves out of the closer role. Stuff-wise, Manzanillo has what it takes to flourish out of a setup role. 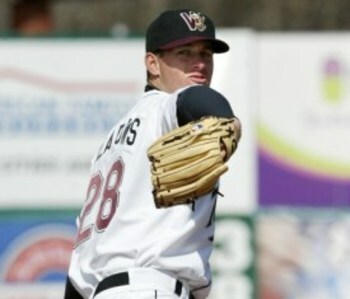 He utilizes a four-seam fastball that tops out in the mid-90s and has reportedly hit triple-digits on a few occasions. He complements it with an effective changeup and power slide to get hitters off balance. If he can continue to hone his pitches and ward off injury, he’ll have a bright future in Milwaukee for years to come. Once a glistening prospect considered to be on the cusp of a big-league promotion at the end of last season, Scarpetta put on an abhorrent showing at the Arizona Fall League where he posted an ERA of 19.43 over just 7.1 innings of work. Things would only get worse from there, when doctors told him he would miss his entire 2012 season due to Tommy John surgery on his right elbow. Still, Scarpetta is only 23 years old and has the stuff of a back-line MLB starter in a best-case scenario. He features a low to mid 90s fastball with some sink to it, a hard-breaking curveball that was nearly plus-average before his surgery and a changeup that improved massively as he progressed through the system. He generated a lot of strikeouts with these three pitches but was also markedly inconsistent command-wise, walking nearly five batters per nine innings pitched over the course of his professional career. With the physique of a big-league innings eater and a determination to break through soon after his surgery, Scarpetta could still definitely offer value as a bullpen type for Milwaukee down the road. His future will rest heavily on his recovery from surgery and a refinement of his control. A lifetime .339/.409/.515 hitter during his three seasons at St. John’s University, Hopkins was especially impressive during his 2010 junior campaign with the Red Storm, where his .358 BA topped that of Big East rivals George Springer and Mike Olt, both of whom are now considered consensus top-50 prospects in all of baseball. The Brewers got him as a mid-round pick that year, and it’s now looking like another huge steal for general manager Doug Melvin. While he posted adequate numbers in rookie ball and the following season in low-A ball, he has been fairly impressive this season in low-A. With a .300/.323/.453 line though the first half, Hopkins has an outside shot to finish atop the organization in those three categories. If he could perpetuate those numbers in subsequent seasons, he would profile nicely at third base sometime down the road. Right now, Hopkins simply needs to make sure his batting average stays above at least .285. He has the defensive skills and hard-working demeanor to play third base. His bat is the only thing keeping him from cracking Triple-A (yes, I said it) by the end of next season. 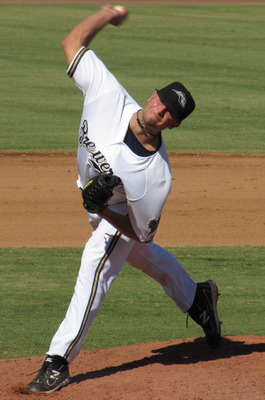 A three-year contributor to the Kennesaw State rotation, Heckathorn was heralded as one of the better right-handers of the 2009 draft class. He was a strikeout machine in college and that was a big reason the Brewers took him at 47th overall that year. Since then, however, he’s been anything but what Milwaukee drafted him for. Finally making his way to double-A ball this season, Heckathorn has harbored a K/9 ratio of just 6.77 during his professional career. His sometimes plus-average control can compensate for his lack of strikeouts, which is what you would hope for considering he doesn’t have a true swing-and-miss pitch. His offerings include a rather flat fastball that sits in the 92-94 MPH range, a hard slider with some projection left on it and a changeup that’s fringe-average at this point. Looking the part of a big league innings-eater at 6’6″, 223 pounds, Heckathorn’s career will ultimately be determined by his ability to spot his pitches. A lack of strikeout pitch coupled with the fact that he leaves the ball over the plate at a high rate (he has a H/9 ratio of 10.1 this season) shows that he’s still a ways off from a big-league appearance. 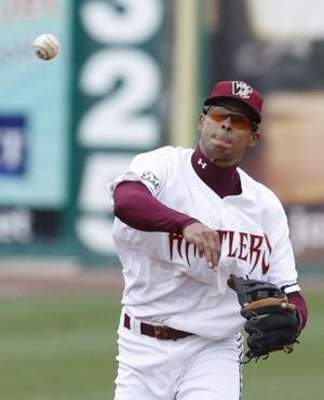 Once thought to challenge Rickie Weeks for the full-time role at second base, Farris is now in the midst of his third consecutive season in Triple-A ball. The difference between this season and his past two seasons, however, seems to be his production at the plate; he’s garnered just a .304 slugging percentage this season compared to a .372 last season. Knocking on the door of 27 years old, Farris’ power decline at the plate will likely keep him from a starting job with the Brewers. He’s an above-average defender at second base and can hold his own at shortstop and the outfield, but the fact that his bat has been lagging so much this season says that he just doesn’t have the capacity to be an effective all-around big leaguer. It’s a shame, too, because he possesses top-tier speed that Ron Roenicke would love to utilize on the bases. After putting up tremendous numbers across the board against tough SEC competition at Tennessee, Davis fell to the Brewers at 39th overall in the 2009 draft and was considered one of the bigger steals of that year’s draft. The athletic outfielder was considered to have the ingredients necessary to be a future five-tool player at the next level. Now, he’s lucky if to sniff the majors in the next two seasons. After tearing up the Midwest league to the tune of a .335/.421/.518 line during his rookie 2010 season, Davis was promoted to high-A Brevard County, where he batted just .244 in 150 plate appearances and witnessed a palpable spike in strikeouts. He spent his entire 2011 season in high-A again, and now resides in double-A, where his ability to hit for power has actually gotten worse. Right now, the only thing keeping him in our top 25 rankings is his speed tool. Davis has tallied 55 career stolen bases to go with a 6.3 SPD rating this season, according to FanGraphs. Of course, his ability to steal bases is severely limited since his below-average bat has almost no projection left on it. Consequently, if Davis has any shot at the bigs, his bat will need major refinement. 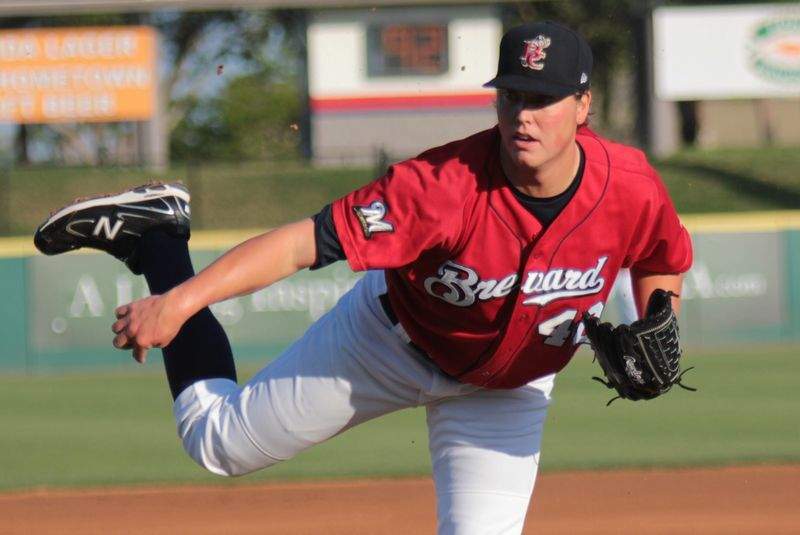 A third round pick from last summer’s draft, Gagnon came into this season overshadowed by the likes of fellow draftees Taylor Jungmann and Jed Bradley. While he is still pitching a full level lower than each, you could make the argument that he’s outperformed both. After blowing through the rookie ranks in seven starts last season, the Long Beach State product has witnessed his strikeout rates diminish noticeably against Midwest League hitters. However, that’s the only area that’s witnessed regression, as he’s been able to hold batters in check to the tune of a .213 BA and a .254 BABIP. He’s looked even better over his first two starts in the Florida State league since his promotion. With a four-pitch mix that includes a low-90s fastball and developing slider, curveball and changeup, Gagnon has the potential to be a quick-riser to the bigs with a chance to be a back-line starter. 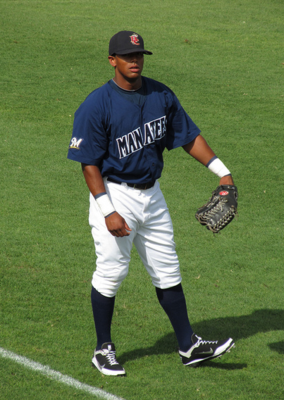 A late-round pickup out of Puerto Rico in the 2009 draft, it’s taken Rivera just over two years to be named the consensus best overall shortstop in Milwaukee’s system. Mind you, there isn’t much competition for the title, however, there are some positives to take away from his game. First and foremost, Rivera is an exceptional defender at shortstop. While he doesn’t have elite speed by any stretch of the imagination, he does have great athleticism that allows him to cover a lot of ground in the infield. Baseball Reference cites that he’s harbored a career range factor of 4.48 over 223 professional games. For comparison’s sake, that not too far off from what former Brewers shortstop J.J. Hardy’s posted this season. Yet while Rivera could probably play a decent shortstop in the bigs right now, it’s his bat that’s held him back from shooting through the system. He’s an aggressive hitter, rarely drawing walks and striking out at a concerning clip. If he can continue to make his swing more compact and continue to work on hitting offspeed offerings, he could see a spike in his offensive yield. Until then, though, he likely won’t see double-A for a few more seasons, which isn’t all that troubling since he’s still very young. The undoubted ace of the small-school Bethune Cookman rotation during his 2009 senior campaign, Burgos fell to Milwaukee in the sixth round of that year’s draft. Since then, his value within the organization took a massive beating due to poor performance against competition in the lower-minors. Then this season came around, and the Puerto Rico native flipped the switch on his previously dwindling career. While he has a bevy of pitches at his disposal that he can throw for strikes, Burgos’ main pitches are a low 90s fastball, slider, curveball and changeup. None have much projection left and they don’t grade out as plus-average, either, though his command with each has been exceptional. He posted a walk rate of just four percent over six starts in high-A ball to start this season. Burgos was pushed up to Double-A ball early on this season and while he flashed glimpses of success, he’s fallen off a bit. His walk rate has more than doubled and batters have teed off on him due to leaving the ball over the plate. If he’s to crack Triple-A or the big-league roster anytime soon, he’ll need to polish up his command a bit more. A guy who’s arguably outperformed any one player from Milwaukee’s abysmal 2009 draft class, Davis has proved to be one of the better bats in a farm system that has been starving for outfield position talent. At 6’0″, 195 pounds, Davis doesn’t possess any one tool that projects to be plus-average at the next level, however, he doesn’t have any known weakness, either. He’s proven to be able to hit for average and little bit of power. He draws a fair number of walks but by that same token has struggled somewhat with strikeouts, most notably posting a strikeout rate of 23.3 percent this season against double-A Southern League pitching. Davis was enjoying a tremendous season at the plate until suffering a leg injury back in mid-May, so much so that he currently holds true to a 168 wRC+. If he can get back to his line-drive hitting ways after returning, there’s a good chance he starts his 2013 campaign in triple-A. 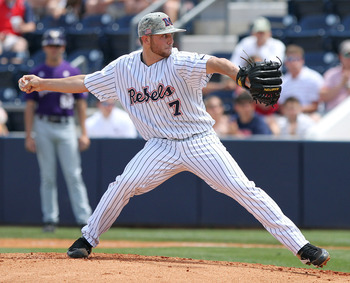 A full-time reliever turned starter by the end of his three-year collegiate stay at Ole Miss, Goforth fell to the Brewers in the seventh round at last year’s draft and should be considered a steal because of it. He showed to have good command of his pitches and the ability to strike out a ton of batters, additionally. Strictly out of a relief role with the rookie club in Helena last season, Goforth struck out 42 batters in just 40.2 innings and posted a walk rate of just 5.8 percent. As a reliever in low-A ball this season, his strikeout yield and command have each witnessed regressions similar to what he went through in making the transition from reliever to starter in college. Those declines have a lot to do with Goforth’s “overpowering” mentality on the bump; he has a four-seamer that touches the upper 90s and a cutter slider that he gets batters off balance with. The Brewers love what this kid has to offer and if he doesn’t start finding success as a starter, management is convinced he has the makeup of a legitimate big-league setup man/closer once his secondary pitches come around. A three-year contributor for head skipper Larry Lee at Cal Poly, Haniger’s most productive season came this year, where he was without question one of the best hitters in the country. In 211 at bats, the stocky outfielder retained a .458 wOBA (weighted on-base average), proving that he was more than capable of racking up extra-base hits. Physically, Haniger has the ideal build of a guy who should hit for some power at the big league level. 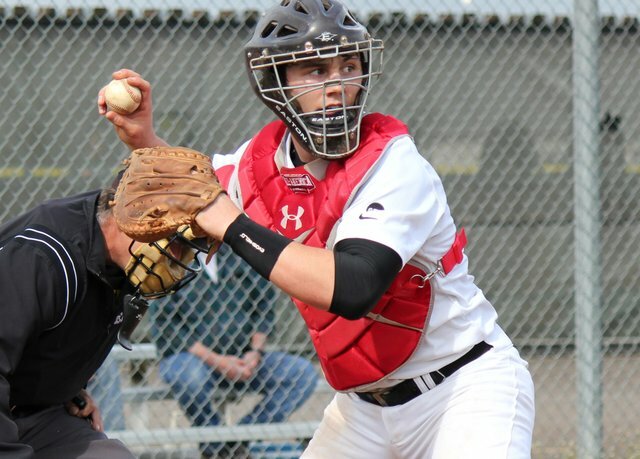 He’s drastically improved his approach at the plate during his junior season and that’s consequently helped him to tap into his power stroke that has a real chance to be plus-average. What’s more, Haniger also boasts a strong arm that should profile nicely in right field. While Prince Fielder held down the fort at first base for the past six or so seasons, it was undoubtedly a tough time to be a first-baseman in the Brewers’ farm system. Now that he’s gone (and the future of Mat Gamel is also in deep question), an opportunity has risen for a handful of players. Leading that pack by a sizeable margin is none other than Hunter Morris. 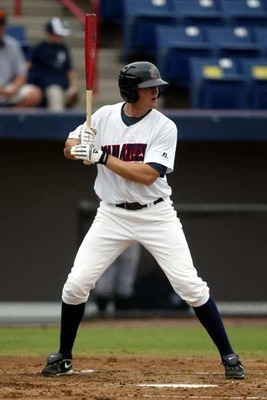 An unmitigated slugger out of the University of Auburn, Morris agreed to sign on with Milwaukee as a fourth-round pick in 2009, and has since then stakes his claim as the top power-hitter in the Brewers’ system. This season, he’s produced career-best numbers in slugging percentage (.525), ISO (.202) and wOBA (.378) in a pitching-friendly double-A Southern League. The only cause for concern right now seems to be his approach at the plate. He struggled with strikeouts in college to some extent and has garnered a career-high strikeout rate of 21.5% thus far this season. If he can shore that facet of his game, I believe he could be playing a full-time first-base for Ron Roenicke by the end of the 2014 season. The general consensus on young talent out of Puerto Rico is that there are plenty of projectable bats to go around but not a whole lot of arms to speak of. Lopez, Milwaukee’s third selection of the 2011 draft, may be one of the very few exceptions to that presumption. 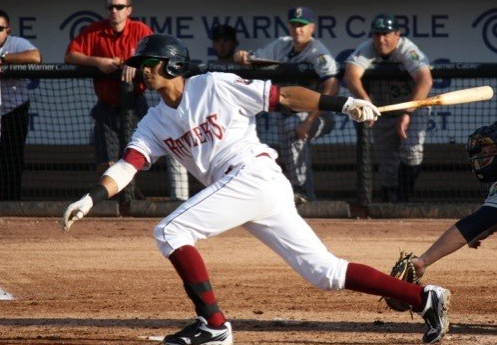 Weighing in at an athletic 6’4″, 165 pounds, Lopez is very raw physically, with a ton of room to pack on some muscle in an effort to add more velocity to his pitches. Right now, he features a fastball that sits in the 89-91 MPH range that he’s shown to throw to both sides of the plate, a curveball that’s already close to big-league ready and a developing changeup. He’ll be a project for Milwaukee to develop, but once he pans out physically, he could be a very, very intriguing prospect. One of the most undervalued prospects in Milwaukee’s system by many scouts, Gennett continues to get his cuts from the left side of the plate as he rises toward the upper-levels of the minors. The impressive part is that those same cuts have resulted in consistent numbers. At 5’9″, 180 pounds, Gennett doesn’t hit for power with much consistency, however, he is able to hit for a high average and knows the importance of getting on base. This season, the former 2009 draft pick has batted an even .300 with a .342 BABIP that’s close to his career .344 BABIP. Representing the Brewers at the 2012 All-Star Futures Game in Kansas City, Gennett had the chance to strut his stuff at the plate in front of many scouts. If he can continue to hit at or above .300 at the double-A and triple-A level, the Brewers will have a tough time not giving him a shot at second base. The second player taken in the 2007 draft from the traditionally talent-laden Pace High School in Pensacola, Florida, one could argue that Gindl has been Milwaukee’s top performing prospect since his 2008 rookie season. From that year up until the end of last season, Gindl has amassed a fairly high WARP rating of 12.7, according to Baseball Prospectus. Physically, Gindl is probably a smidge undersized, however, he is able to generate a lot of home runs and gap power with a short, compact swing and strong hands at the plate. While he can run at an adequate rate, speed doesn’t really play into his game a whole lot and will be fringe-average at the next level. Moreover, his arm is nothing to write home about, which leads many scouts to believe he profiles as more of a corner outfielder if anything. Gindl got off to an uncharacteristically slow start this season but has torched the competition this month. Still just 23 years old, the Brewers would love to hang on to him as long as they can; he could have a shot to stick it in the bigs as a platoon type right-fielder by the end of next season. Designated for assignment with Milwaukee’s rookie club in Arizona to start his pro career, the 27th overall pick in last month’s draft looks to become the fastest-rising high schooler in the Brewers’ system since Prince Fielder in 2002. And if his physical tools, high school statistical yield and hard-working demeanor are any indication, he should be able to do just that. At 6’3″, 215 pounds, Coulter is a physical specimen by any standards. Justin Roswell, Senior Director of Team One Baseball, deems the 18-year-old to have “big man strength“. That natural strength could turn him into a consistent line-drive power threat at the big league level. He has a balanced approach at the plate and a swing that’s quick and has little wasted movement. In a Brewers farm system that was bereft of any elite bats prior to the draft, Coulter could vie to be Milwaukee’s top hitter on the farm with a solid showing at the plate this year. 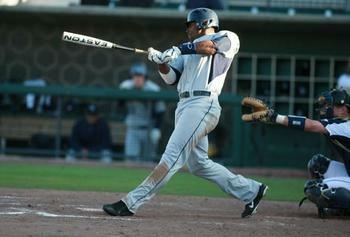 Leading the country in home runs (30) as a sophomore in 2011, Roache was one of the most productive position players in all of college baseball during his stay at Georgia Southern, where he averaged a .289/.423/.621 line as a two-year starter. Had he not suffered a broken wrist just seven games into his junior campaign, he would have surely been a top-10 pick instead of Milwaukee’s final 2012 first-round draftee. Nevertheless, the Brewers remain staunch in their belief that Roache has a lot of helium, and it’s tough to disagree with that sentiment. At 6’2”, 225 pounds, the Michigan native has enough athleticism to play the outfield with an average arm that would profile nicely at either corner position, though he could ultimately end up in center depending on how well he performs in the next few seasons. He is an absolute force at the plate, moreover, having great pitch-recognition with violently quick-hands that drive the ball to all fields. To me, he looks like a more muscular version of Alfonso Soriano at the dish. Roache is currently rehabbing in preparation for offseason competition, possibly even the Arizona Fall League. We should be able to gauge how quick he’ll rise to the majors based off his performance in those leagues. One of the better all-around position players in the system, Schafer does just about everything in a proficient manner. His bat has been exceptional since his rookie season in 2008 and has been able to tap into some power with it as well. Moreover, Schafer might just be the best defender down on the farm. After putting up a combined .315/.385/.439 line last season, Schafer has nearly worked his way back up to those numbers this season despite harboring an uncharacteristic .265 BA in the season’s first two months. His power-stroke has exhibited itself once more this season, holding true to a .138 ISO in 289 plate appearances. Possibly his best tool, Schafer’s defense in the outfield this season has been arguably the best of his career. Right now, the Cal Poly product maintains a 2.42 range factor at the triple-A level compared to his career 2.27 range factor. Should he break through to the majors, it will be his coveted glove that will carry him. 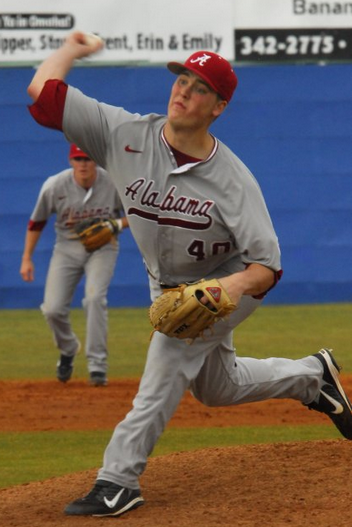 Turning down the opportunity to join the Reds’ farm system as a 39thround pick in 2009 out of high school, Nelson was able to hone his pitches and grow into his massive build at the University of Alabama for three seasons before signing on with Milwaukee as a second-rounder in 2010. Since then, Nelson put together two solid seasons of professional ball. Neither, however, has been as impressive as his current campaign. After working to develop his changeup this past offseason, the 6’6”, 245-pound Florida native was able to thoroughly dominated the competition, posting a 2.21 ERA and 1.08 WHIP in 13 high-A ball starts, striking out just under a batter per inning. His achievement warranted a promotion to double-A, where he looks to see his improved offerings prompt a promotion to the Pacific Coast league in the near future. Given his gargantuan yet still prototypical frame, credible three-pitch mix – that includes a low to mid-90s sinker, slider with plus-average movement and drastically improved changeup – and willingness to listen and get better, I’d say Nelson has the chance to reach the bigs possibly by the end of next season with a good chance to stick there by 2014. In the weeks following up to 2010 draft, there were a handful of scouts who hadn’t made up their minds over what Thornburg best projected to be – a below-average defensive position player with some pop in his swing, a slightly undersized starter who’d eventually struggle to eat innings or a kid who would utilize his hard-throwing nature to flourish out of a bullpen role. Now just over two years later, scouts know exactly what Thornburg projects to be: A future big-league strikeout machine, no matter the role. After making a mockery of hitters at the rookie ranks in 2010 to the tune of 38 strikeouts in just 23.1 innings, Thornburg posted almost as gaudy of number his following season between low-A and high-A ball, garnering a 10.5 K/9 ratio in 24 starts. This season, his yield was simply too overwhelming (8.5 K/9 in 13 double-A starts) to ignore, as he was able to make his first big-league start with Milwaukee on June 19. While there are still some concerns about Thornburg’s taxing delivery and how well his arm might be able to hold up, there’s no denying that the guy simply knows how to get batters out with his stuff. If he can prove to go deeper into his starts by the end of this season, who knows where he’ll be pitching this time next year. 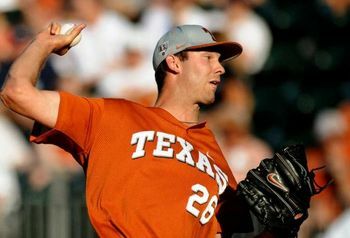 After putting up ridiculous numbers his junior season with Texas and being Milwaukee’s first selection in the 2011 draft, Jungmann faced tremendous expectations coming into the season. While he hasn’t been the strikeout machine many have expected, there have been plenty of positive takeaways thus farm. In a Florida State League that houses some of the most advanced hitting prospects in the minors, Jungmann has averaged over six innings per start and has garnered an impressive walk rate of 6.8 percent. Sure, his strikeouts have been down at just six punchouts per nine innings, but the fact that he goes deep into most of his starts (he already has a complete game to his credit) says a lot about the workhorse-type of pitcher the Brewers believe he can be. Jungmann features three pitches that graded out as plus-average at the draft last summer. His mid-90s four-seam fastball tops out at 98 MPH and his curveball has nice, sweeping bend to it. His changeup complements his fastball nicely and probably has more projection on it than any other of his offerings at this juncture. Leading a shallow crop of left-handers in the 2011 draft, the Brewers were pleasantly surprised that Bradley fell to them at the No. 15 overall slot. 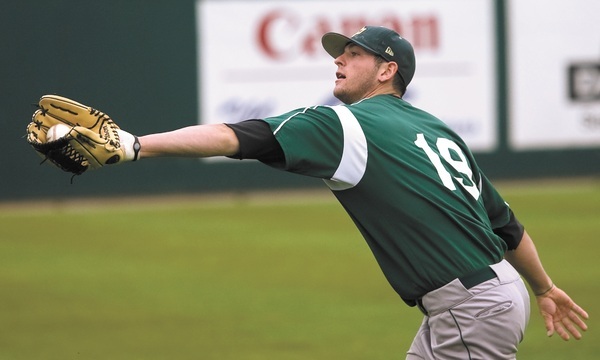 After dominating for three seasons at Georgia Tech in which he went fanned over a batter per inning while conceding just one home run over 16 starts in his junior season, many scouts believed Bradley was one of the biggest steals of the draft – it’s easy to see why. Having four pitches – a fastball that sits around 93-90 MPH, big-bending curveball, slider and changeup – that he has proven to throw strikes and induce a lot of swings-and-misses with, Bradley’s stuff isn’t that far from big-league ready. Moreover, his prototypical 6’4”, 225-pound frame suggests he could be areal innings-eater as a professional. Put that all together, and he’s believed to have the makeup of a solid No. 2 in a five-man big league rotation. While he’s been fairly inconsistent in high-A ball this season, Bradley has managed to put together a string of solid starts. If he continues that type of production, there’s no doubting he has the chance to fly through the system and make his big-league debut possibly by the end of 2013. Beginning his professional career as a undrafted free-agent out of Puerto Rico at just 17 years old in 2006, Peralta’s lengthy stay in the minors has him atop many scouts’ organization prospect rankings for a multitude of reasons. A big, durable frame to go with three big-league ready offerings are just a few of those aforementioned reasons. At 6’2″, 240 pounds, Peralta has the a strong build that should be able to handle 30 or more starts at the big league level. He’s averaged roughly six innings per start since pitching exclusively as a starter back in 2010. For comparison’s sake, that’s about what Yovani Gallardo averaged during his stay in the minors. Peralta throws a mid-90s fastball and an average changeup with little projection left on it. His best pitch is easily his slider, having great movement that induces a lot of swings-and-misses. The biggest reason for his delayed ETA has to be his command issues, which have been woefully obvious thus far this season, holding true to a walk rate of 13.2 percent over 14 starts. Despite his struggles this season, Peralta is by my estimation the most well-rounded pitcher in Milwaukee’s system. 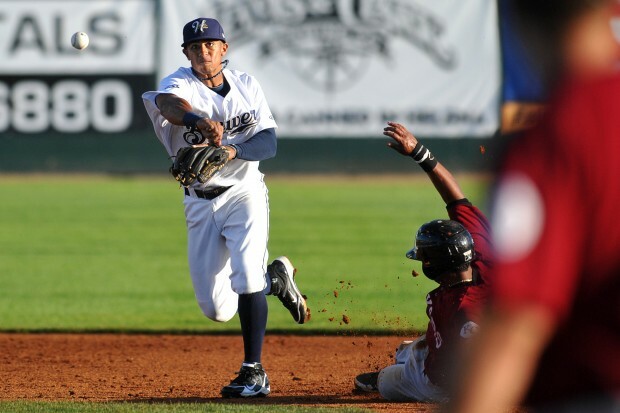 The dawn of a new season is almost upon us, and for as much attention as the Brewers will get as opening day draws nearer, there are plenty of reasons to be excited for minor leauge baseball’s 2012 season. Let’s break down Milwaukee’s top 25 prospects heading into this season with a bold prediction for each player. Relatively unknown throughout the system, David Goforth is a sleeper prospect who could scoot through the system. Selected in the seventh round of last summer’s draft, scouts have taken notice to his concise two-pitch repertoire composed of a high-90s fastball and plus-average cutter. He found limited success as a starter in college, but his stuff suggests he should develop into an effective late-inning reliever. Last season in rookie ball, Goforth appeared in 19 games and posted a 4.43 ERA, struck out 42 in 40.1 innings of work and walked just 10. If there’s one knock on his game, it’s his command, but that should be cleared up as he moves his way through the system. 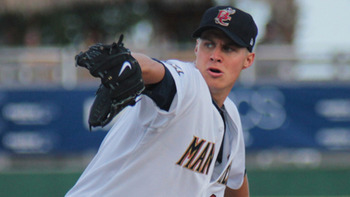 Prediction: I like what Goforth has to offer and see him developing into a solid reliever at the big league level. In regards to this season, though, I think he spends all of 2012 in low-A ball. The Brewers thought they had their shortstop of the future in Alcides Escobar, but since he now resides in Kansas City, there’s suddenly a window of opportunity for 19-year-old Yadiel Rivera. A ninth-round selection out of Manuela Toro High School in Puerto Rico, Rivera has a tremendous amount of athleticism on the diamond. Through two professional seasons, the youngster carries an unimpressive .939 fielding percentage but made up for his inconsistencies with a 4.59 range factor. His bat remains in question after posting a combined .236 BA and .372 slugging percentage between rookie and low-A ball last season. He’ll also need to cut down on his strikeouts and discipline at the plate moving forward. Prediction: Clearly, Rivera has a special gift when it comes to playing defense. His range is ridiculous given his time in the league but his inconsistencies are a question mark also. I look for him to start 2012 in low-A ball and get promoted to high-A ball by season’s end. There’s always a high demand for players who can play multiple positions as the big league level, and Zelous Wheeler fits the bill as being a genuine utility-man for years to come. Since his rookie season in 2007, Wheeler has bounced his way around the diamond, getting playing time at shortstop, second-base and third base, carrying a .944 fielding percentage and 3.09 range. He’s been modest with the bat, as well, holding true to a career .271 BA and .408 slugging percentage. Wheeler’s game and journey to the majors is comparable to former Brewer utility man Jerry Hairston Jr. He’s got a great passion for the game and has the intangibles managers love. Prediction: Having spent a considerable amount of time in double-A over the past two years, Wheeler could use some time in triple-A to refine his game, though he’s just about ready to contribute as an off-the-bench type player for the Brewers. 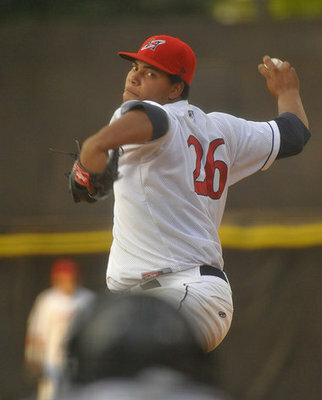 I look for him to start 2012 in triple-A and earn a September call-up this fall. At 26 years old, Brock Kjeldgaard barely qualifies as being a legitimate prospect. 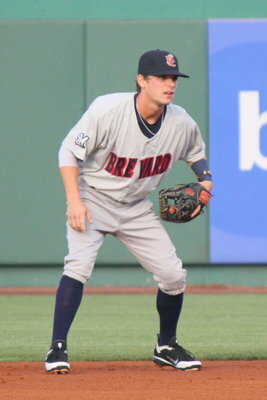 Taken by Milwaukee in the 34th round of the 2005 draft, Kjeldgaard has spent five professional seasons in the system, garnering a reputation for being a true slugger every step of the way. His career .464 slugging percentage .801 OPS stacks up nicely against the competition. Last season, Kjeldgaard blasted 24 home runs and 76 RBI to go with a .495 slugging percentage that ranked third best among all prospects in Milwaukee’s system. Prediction: Though he may have power, I wouldn’t read too much into his future with the organization. Sure, the Brewers added him to their 40-man roster to start spring training, but I ultimately look for him to spend 2012 in triple-A. Another late-bloomer, 26-year-old Mike Fiers has spent just two seasons in the system. What he’s done in his time in the minors, though, has been truly impressive. In 290-plus career innings (37 GS), Fiers boasts a 2.50 ERA and 0.98 WHIP, striking out 321 while walking just 73 (4.40 K/BB). 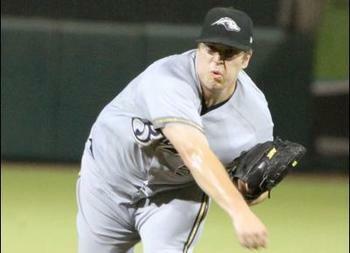 Last year, he went 13-3 with a 1.86 ERA and was named Milwaukee’s minor league pitcher of the year for his efforts. If he was a couple years younger, we might be talking about a top-caliber prospect. Prediction: Fiers will come into spring training fully expecting to make the opening day roster, and I think he will do just that. I look for him to be a key contributor out of the ‘pen for the Brewers all season long. An 18th-round draft pick by the Brewers in 2008, Nick Bucci’s career up to this point has been anything but extraordinary. But after a solid 2011 season in high-A Brevard County where he went 8-11 with a 3.84 ERA, things could be looking up for the youngster. After struggling with command issues that led to an abysmal 5.07 BB/9 IP in 2010, Bucci recovered in 2011, lowering his his BB/9 IP to a wholesome 3.06. While his ERA will need to be lowered a tad in the coming season, there’s no doubt Bucci has quality stuff. His fastball tops out anywhere from 89-93 MPH and often flashes a plus-average curveball that could present itself as a real weapon in the coming years. Prediction: The way I and many scouts see it, Bucci has the makings of a quality relief pitcher at the major league level, though that could still be a ways off at this point. He has the ideal frame to be a solid arm out of the bullpen and has a slightly plus-average fastball that should serve him well. I predict Bucci to come out the gates strong to start this season and eventually find his way to triple-A. The Brewers are markedly devoid of talented left-handed pitching down on the farm, but Dan Meadows has a decent chance to break through to the majors sometime in the near future. At 24 years old, Meadows has four seasons of professional ball under his belt and has performed well in each. 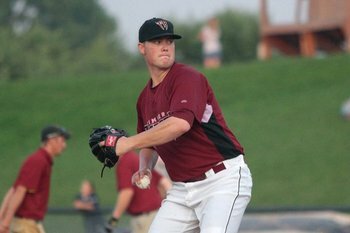 In 2009, he started 11 games for low-A Wisconsin and went 13-6 with a 4.01 ERA, showing the ability to be an innings-eater as a starter though he really shined in his role as a middle-innings reliever. Last season in triple-A, Meadows pitched 35.2 innings, striking out 35 while holding batters to a .248 BA. He’s flashed solid control throughout his career and is able to make up for his lack of velocity with a lethal slider, his go-to pitch in tough jams. Prediction: It’s already a given that Meadows will start in triple-A, though what he does in his time there will determine how fast he reaches the majors. I look for him to spend all of 2012 down in Nashville to prime himself for a promotion in 2013. 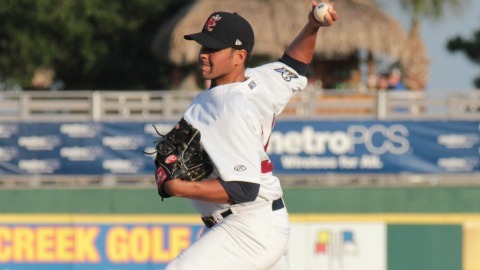 Santo Manzanillo found his way into the system as a non-draft pick free agent in 2006, but has only recently tapped into his capabilities as a premium reliever. 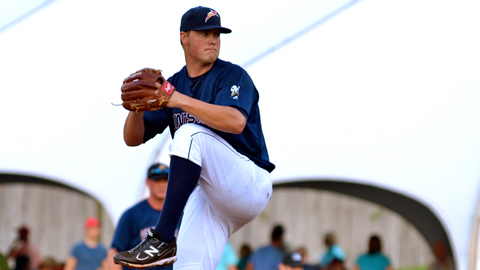 Last season, the 6’0″, 190-pounder made his way through high-A Brevard County as well as double-A Huntsville, garnering a combined 1.75 ERA with 62 strikeouts (9.0 K/9 IP), 1.14 WHIP and .194 BAA. 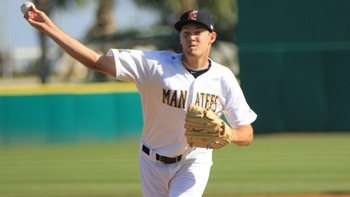 Manzanillo has a plus-fastball that has allowed him to materialize into one of the Brewers’ top strikeouts prospects, topping out at 99 and regularly sitting in the 94-97 range. If he’s able to limit batters in the fashion he’s shown thus far, he could be placed on the fast-track to reach the majors sometime in 2013. Prediction: After separating his right shoulder in a car accident last December, the Brewers will obviously err on the side of caution with Manzanillo moving forward. With that in mind, I think he spends his entire 2012 campaign in double-A. Once upon a time, Kyle Heckathorn was arguably Milwaukee’s top evolving starter and looked to push for the big leagues by 2013. 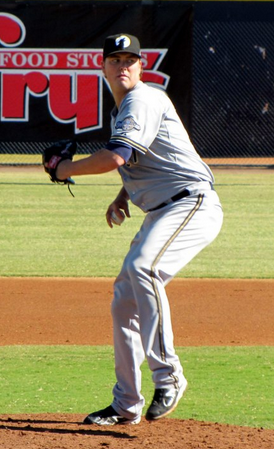 In 2010, the big right-hander was awarded as the Brewers’ top pitching prospect in the entire system, going 10-6 with a 2.98 ERA and walking just 33 batters in 124 innings between low-A and high-A ball. 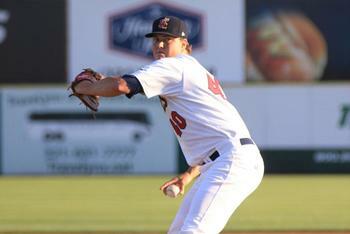 His success curtailed in 2011, though, posting an unsightly 7.18 ERA in seven starts in double-A. While there’s certainly some cause for concern after such an abhorrent preview to double-A ball, we must not forget what Heckathorn brings to the table. 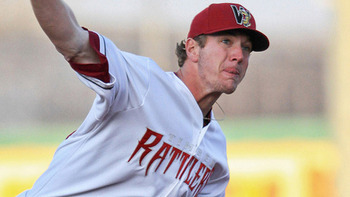 At 6’6″, 225 pounds, Heckathorn has the physical makings of a mid-rotation innings-eater at the big league level. His fastball ranges anywhere from 97-93 MPH and he also features a hard slider and changeup that has, at times, garnered a considerable amount of attention from scouts. Prediction: I tend to be a bit more optimistic about Heckathorn than many scouts. His physical makeup screams future starter at the big league level. I expect him to re-dedicate himself and eventually move his way up to triple-A before the end of next season. Admittedly, watching Kentrail Davis play is a bit aggravating. While has the speed, plate discipline, and physical makeup that would allow him to be an excellent leadoff hitter at the major league level, he has yet to develop and tap-into his power potential at the plate, one of the prevailing reasons why he has yet to break through to the upper minors. Last season at high-A Brevard County, Davis batted .245 with eight home runs, 46 RBI, 76 runs scored while also notching 33 stolen bases. He only managed a .317 on-base percentage and .361 slugging percentage, though, making it rather apparent that he still has a while to develop. Prediction: This will be a defining year for Davis in his quest for the majors. He’s now spent two seasons in high-A ball and is still looking for a promotion double-A. After a solid showing at the Arizona Fall League, I think he starts 2012 in high-A and merits an early promotion, spending the remainder of his season in double-A Huntsville. 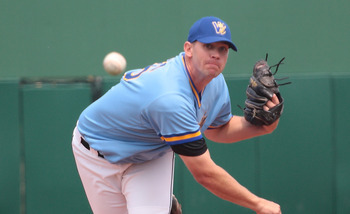 One of the key elements from the Brewers’ exceptionally successful 2010 draft, Austin Ross has the makings of a solid back-of-the-rotation starter at the major league level. After a solid rookie campaign in Helena, Ross worked his way through the lower-portion of the system in 2011. Going 10-7 with a 5.28 ERA in 25 starts between low-A and high-A ball, he’s shown to be ready to break through to double-A in the very near future, and it wouldn’t surprise me if he’s promoted early on in 2012. Unlike most of the pitchers featured on this list, Ross’ game is predicated on working his way around batters with above-average control as well as his ability to limit his mistakes. I like what he has to offer and find his game comparable to Jeff Suppan. Prediction: The fact that Ross is already on the cusp of breaking through to double-A ball after just two professional seasons speaks volumes to his game. 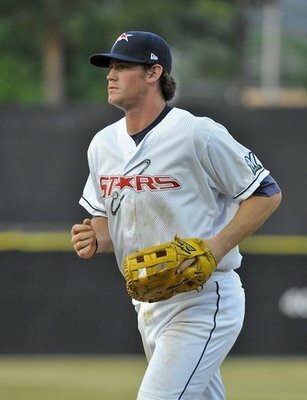 I look for him to start 2012 in high-A ball but quickly get promoted to double-A. 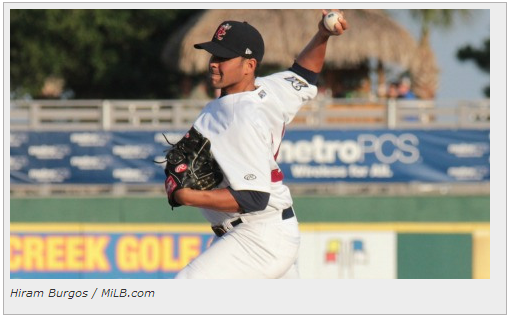 At this stage of his once very promising career, Amaury Rivas barely qualifies as a prospect. He’s now 26 years old and has just stumbled his way through the system thus far. Signing as a non-draft pick back in 2005, Rivas’ game was a pedestrian as you can imagine. However, after a promotion to high-A ball in 2009, his production took off, going 13-7 with a 2.98 ERA, 123 strikeouts (8.3 K/9 IP) and .218 BAA. 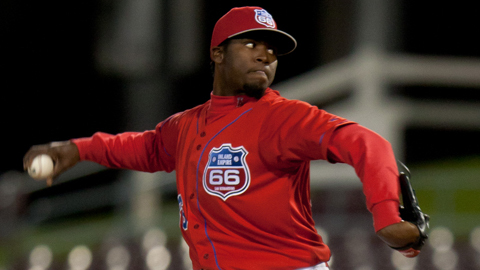 Last season in triple-A ball, Rivas went 7-12 with a repulsive 4.72 ERA. However, that was the least of his worries, as he managed to strike out just 16 percent of his batters, which was at one point one of the staples to his game. He should probably be higher on this list, but such an ugly 2011 campaign has reignited my doubts about his future. Prediction: In my mind, 2012 will prove to be either Rivas’ breakout year to the majors or the year he puts himself in the same category as Mark Rogers as being an utter disappointment. Unfortunately, I just don’t see him getting out of triple-A this year; possibly a September call-up with minimal opportunities at best. Just two years ago, Eric Farris was the toast of the entire Brewers organization. Hoarding an unprecedented 70 stolen bases in just 124 games at high-A Brevard County, he was seemingly on the cusp of breaking through to the majors after just his third minor league season. However, knee injury early in 2010 derailed his momentum, setting him back a few years as management continues to err on the side of caution. Last year at triple-A, Farris got back into the swing of things and managed a .271 BA with six home runs, 55 RBI, 70 runs scored and 21 stolen bases. He’ll turn 26 in March, and his time in the minors would be well past him if not for Rickie Weeks holding things down at second base. Prediction: In almost any other farm system, Farris would be considered a top prospect — and deservedly so. His speed is overwhelming and, as I see it, will manifest itself in the form of a September call-up next fall. There have been few prospects that have come through Milwaukee’s system with as much upside as Cody Scarpetta. An 11th round draft pick in 2007, he’s posted some truly impressive numbers thus far in his professional career. In high-A ball in 2010, Scarpetta went the distance by administering 128 innings with a 3.87 ERA, striking out 142 (10 K/9 IP) while holding batters to a .241 BA. Thanks to a fastball that ranges from 90-94 MPH with what many scouts deem the system’s best curveball, Scarpetta has tremendous strikeout abilities. His command is in question, though, as his SO/BB ratio fell to an abysmal 1.61 last year in double-A. Prediction: Scarpetta’s prowess on the mound was supposed to make him a top-tier prospect a few years back. His production has diminished, clearly, but I still see a ton of potential. 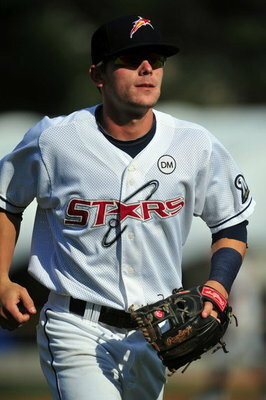 I look for him to start 2012 in double-A and ultimately reach triple-A sometime in mid-summer. With Prince Fielder gone, there’s never been a better time to be a first-base prospect in the Brewers’ system. Consequently, things could (and will) be looking up for Hunter Morris. In just two professional seasons, Morris has managed to tear his way through the system thanks in large part to his undeniable amount of power. 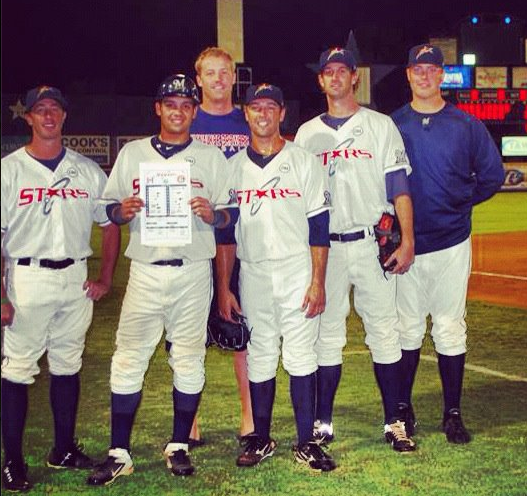 The Auburn product lit up opposing pitching in high-A ball early on in 2011 to the tune of 20 home runs, 69 RBI and a .461 slugging percentage, prompting a late-season promotion to double-A ball. It should be interesting to see how Morris’ game translates to the upper levels of the minors, as pitching will become much more polished. Prediction: If Mat Gamel struggles to replace Fielder this season, I think management will push Morris up to triple-A by the end of 2012. Regardless, I look for him to end up in triple-A at season’s end. There aren’t many true power hitters within the Brewers organization, and none of them look to have a very high ceiling at that. Gindl, though, might be an exception to that fact. At 23 years old and four solid professional seasons under his belt, Gindl is as prepared as he’ll ever be to break through to the majors in 2012, even if it means simply being an off-the-bench type player. He’s amassed at least 13 home runs and 60 RBI in three seasons down in the minors. Not terribly impressive, but it was enough for Milwaukee to add him to their 40-man roster. Last season in triple-A, he maintained a .307/.390/.472 line with 15 home runs and 60 RBI. Couple his slightly above-average power with a competent glove, and he could get a chance to platoon with a number of other players in Ryan Braun’s spot in left field. Prediction: Gindl will come into spring training with a legitimate chance at making the opening-day 25-man roster. And though nothing is for certain even in early February, I expect him to start his 2012 campaign in triple-A and wind up as a September call-up. The Brewers were hell-bent on stockpiling young arms in last summer’s draft, and they managed to nab Jorge Lopez in the second-round. 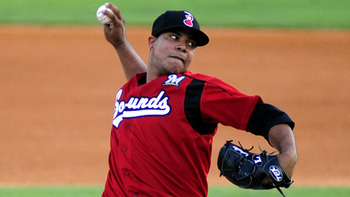 He was the top rated prospect coming out of Puerto Rico and Milwaukee certainly liked what the youngster has to offer. At 6’4″, 165 pounds, the 18-year-old right-hander has the size to be a durable mid-rotation starter at the big league level, though there’s no doubting he’ll need to pack on some strength as he moves his way through the organization. His fastball tops out at the mid to low 90s and has a curveball that may develop into a plus-pitch. Lopez does have command issues but that should be clear up in a timely fashion. Last year in rookie ball he started four games and garnered a 2.25 ERA, striking out 10 and walking three in 12 innings. Prediction: From what I’ve gathered, scouts are surprisingly high on Lopez and I anticipate him moving through the system swiftly. I’ve had limited opportunities to watch highlights of his game, but when I’ve been able to break down his stuff, I think he’s got a tremendous amount of potential. That said, I think he winds up in low-A ball for the entirety of 2012. 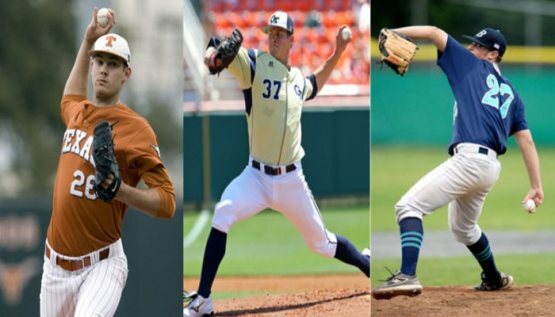 Ever wondered what scouts mean by the “ideal frame” when talking about young pitchers? One look at Jimmy Nelson will explain everything. One of the cornerstone’s to Milwaukee’s 2010 draft, Nelson weighs in at 6’6″, 245 pounds and uses every ounce of his prototypical frame to his advantage. He features a mid-90s four-seam fastball and a slider that’s arguably the best in the system, as well as a solid changeup that’s improved leaps and bounds over the past year. 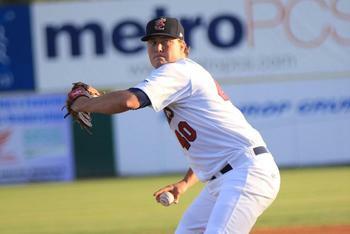 Nelson spent his entire 2011 campaign in low-A ball, going 8-9 with a 4.38 ERA, 120 strikeouts in 146 innings. He stumbled with walks, managing a 1.85 SO/BB ratio, however he held batters to a .260 BA. Prediction: It remains to be seen where he’ll start 2012, but my gut feeling tells me he’ll stay put. Having said that, though, I have great confidence in Nelson to move his way up to double-A ball by the end of 2012, as he’s simply one of the most surefire pitching prospects the Brewers have seen in a while. At 25 years old, Logan Scafer has been knocking on door to the majors for a while now. 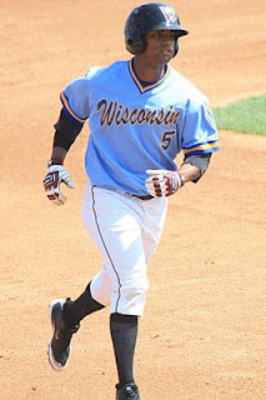 And with Milwaukee’s current outfield situation, now will be his time to make an impression on the organization. 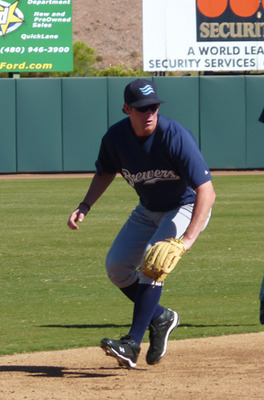 Drafted by the Brewers back in 2008, Schafer has proved to be the closest there is to a five-tool player in the system. Last season, he batted .315 with five home runs, 43 RBI, 66 runs scored and 16 stolen bases. He’s been a defensive wiz in the outfield, garnering a career .988 fielding percentage while commiting just seven errors. Schafer’s capabilities merited a September call-up last fall, though he remained solely an off-the-bench player and was only allowed three plate appearances. Prediction: Ryan Braun’s absence presents a perfect situation for Schafer to strut his stuff early on this season. If he can impress Ron Roenicke during spring training, I think he could get a considerable amount of playing time. Smaller players will always be subject to great amounts of skepticism, but Scooter Gennett has been able to prove his doubters wrong up to this point in his career. In his first two professional seasons, the 21-year-old Florida State product has averaged a .304 BA, nine home runs, 53 RBI, 13 stolen bases and 81 runs scored per season through low-A and high-A ball. And while his stature would lead you to believe otherwise, he does have gap power, managing 59 total doubles and a .433 slugging percentage. Originally drafted as a shortstop, Gennett now resides at second base, where he does have work to do, garnering a career .964 fielding percentage. Prediction: Coming off a stellar Arizona Fall League showcase, Gennett’s stock is currently soaring. Nevertheless, I still expect him to start 2012 in high-A ball and make the hardest jump to double-A ball sometime in June. Taylor Green was one of the best hitters in the minors leagues last season, and there’s really not much more you need to know than that. In 120 games at the triple-A level, Green dominated the Pacific Coast league to the tune of a .336 BA, 22 home runs and 88 RBI. 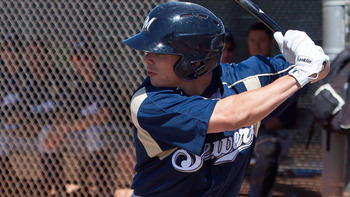 He led the organization in BA, on-base percentage (.412) and slugging percentage (.580), and was named the Brewers’ top positional prospect for 2011. Thanks to Casey McGehee’s struggles, Green earned a September call-up last fall and found his way onto the field, amassing 10 hits in 37 at-bats during his time with the Brewers. Prediction: The signing of Aramis Ramirez doesn’t bode well for Green, who was hoping for a shot at the starting position coming into the offseason. I look for him to become an off-the-bench type player in his first full season with Milwaukee. In a farm system devoid of top-tier pitching talent, Tyler Thornburg has transformed into the complete pitcher the Brewers recognized when they took him 96th overall in the 2010 draft. In his first two professional seasons, Thornburg has been a strikeout machine, punching out 198 batters in 160 innings, enough for a rather impressive 11.1 K/9 ratio. He can run his fastball up to the mid-90s and has a curveball that has developed into his strikeout pitch. Last season at high-A Brevard County, he went 3-6 with a 3.57 ERA and 1.14 WHIP. However, what’s most impressive is how he held batters to a remarkable .186 BA and .256 BABIP. Prediction: In my eyes, Thornburg is in for a huge year. He’s already proven to be competent at just about every facet of his craft, and he’s now ready to sprint through the system. If he can cut down his walks — as I expect him to — I see him pushing for triple-A by season’s end. 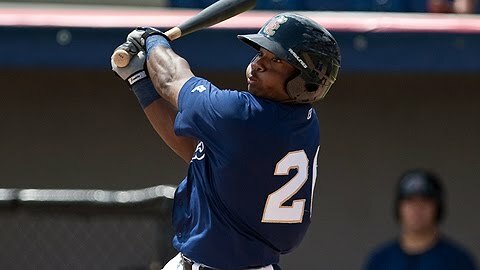 Prediction: Rumor has it that Bradley will start 2012 at high-A Brevard County as he looks to speed through the system in the coming year(s). I used parentheses because there’s some speculation that says he could see playing time in triple-A this season, though that doesn’t seem likely. I look for him to strut his stuff at high-A ball and take his talents to double-A late next season. College baseball’s top player from a season ago will come into spring training with a surplus of hype, and deservedly so. 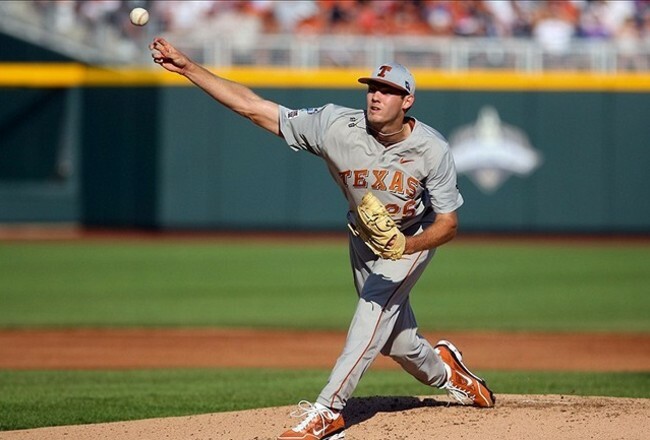 In his last season at Texas, Taylor Jungmann dominated the Big 12 and the rest of the country to the tune of a 13-3 record, minuscule 1.60 ERA, .165 BAA while striking out 126 batters in 141 innings of work. He also posted a 0.83 WHIP and allowed just four home runs all season. When the Brewers took him 12th overall in last June’s draft, it’s safe to say they found they’re ace of the future behind Yovani Gallardo. Jungmann’s MLB ceiling is incredibly high and as we visited last month, I believe he has the most potential among all Brewers prospects. His thin yet sustainable body has enabled his fastball to reach the 95-97 MPH range with great command. Prediction: Word on the street says Jungmann will start 2012 in high-A ball, and all signs are pointing to him racing through the system. If that’s the case, I think we could see him in double-A by season’s end. Wily Peralta’s journey through Milwaukee’s system has been well-documented, signing at the ripe age of 16. Now at 22 years old and six professional seasons under his belt, he’s ready to contribute at the major league level. Last season between double-A and triple-A ball, the 6’2″, 240-pound right-hander went a combined 11-7 with a solid 3.17 ERA. He also struck out 157 in 150.2 innings, holding batters to a .233 BA in the meantime thanks to his mid-90s fastball and plus-average slider and changeup. Brewers fans have awaited Peralta’s big-league debut for a while now, and all indications are that he’ll be on the opening day roster, most likely contributing out of the bullpen. Prediction: While Peralta’s minor league days may be behind him, I don’t think we should expect him be a big contributor right out of the gates. 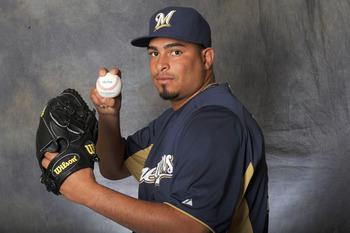 Nevertheless, I look for him to make at least one start for the Brewers by the end of 2012.